A superbly musical performer, this is one of the very best phonostages at or near the price - as ever - an audition in your own system is essential. Sonically delivers in buckets. Much deeper tighter and detailed bass. Midrange and highs are luscious and rich. Faultless performance on a wide range of music from 70s and 80s through to classical and dance. Significant reduction in rumble and recording noise to reveal surperb clarity and depth of soundstage. The price! Cabling termination isn't as well done as the build of the unit but I've had no problems with this. Needs a good deal of running in before you get a smile on your face. 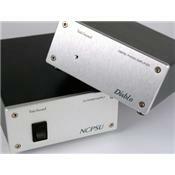 Having tried several phono stages priced just below this level I can honestly say you do pay for what you get. The Diablo is put together with military precision with a beautifully milled aluminium fascia to both the main unit and Never connected PSU. I have tried both the 'entry level' transformer PSU and the top level never connected and after many hours use can report that there is a marginal but noticable difference in the two PSUs particularly in the way in which vocals and imaging is delivered. This will not reveal itself until the units are fully run in which took me around 30-40 hours of use. However the results are amazing and this little unit has re-educated me in the superiority of vinyl over CD. I use a humble Rega P3 with Ortofon Rhomman cartridge but this setup now sounds like something 5 or 6 times its price level! Open and truely engaging soundstages the unit literally digs more and more detail out of each record it plays. Overall I would say a considerable investment like this can be a matter of choice and I would recommend you find a dealer like mine in Manchester UK who is able to let you borrow the equiment for a couple of weeks insitu to find out what its really like to live with.